Since signing a U.N. pact in June 2012, 176 boys have been freed from the "Tatmadaw"
Editor's note: CNN's On the Road series takes you to different countries, exploring the challenges and opportunities they face. In October we visit Myanmar focusing on the country's development and putting its transformation in a global context. Bogale, Myanmar (CNN) -- Zaw Min Paing squats in the dirt, his hands deftly cranking a spanner to unscrew the bolts on his motorbike. He works swiftly, efficiently and reasonably enthusiastically for someone who never wanted to be a mechanic. He is 20 years old and would have finished school if not for the army recruiters who one day lured him away from his home with the promise of a way to earn money to support his struggling parents. His father rides a trishaw, earning a couple of dollars by taking locals on short trips around town on his three-wheeled bike, while his mother gets up early to sell boiled beans to commuters. "(The recruiters) tried to persuade me to join the army. At that time my family business was also very hard, so I am confused and I am following them," Zaw Min Paing said. He was 14. Zaw Min Paing is one of an unknown number of Burmese children believed to be concealed within the ranks of Myanmar's military, known as the Tatmadaw. 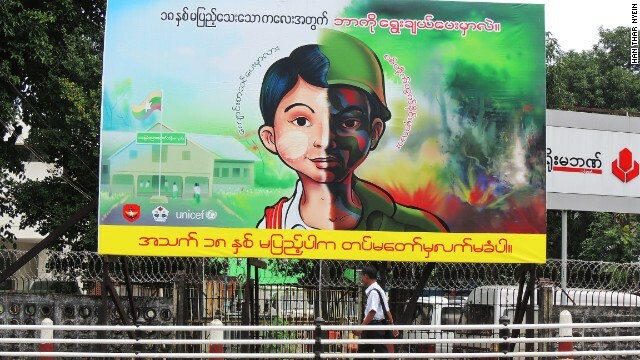 A sign recently erected in Yangon aims to raise awareness of the illegal recruitment of underage boys to the Burmese state military. It asks whether this boy should be in school or the army. 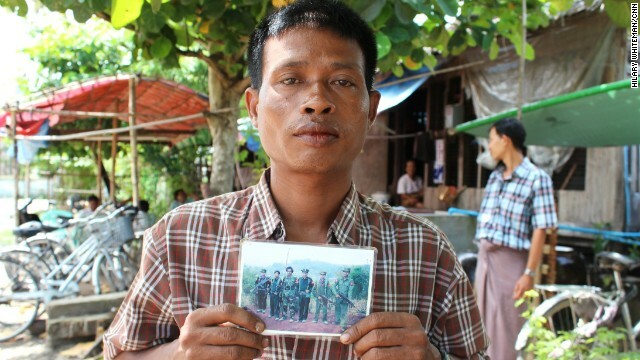 Zaw Min Paing poses with his army documentation. He was recruited at the age of 15 and spent more than four months in a training center before being released to his parents. He's now 19 and has given up hope of ever finishing school. Zaw Min Paing lives in Bogale, a small township in the Irrawaddy region, four hours south of Yangon. The road to the town runs through an area once rich in rice paddies. Houses like these appear sporadically along the road, with bridges allowing residents to cross water-filled ditches. 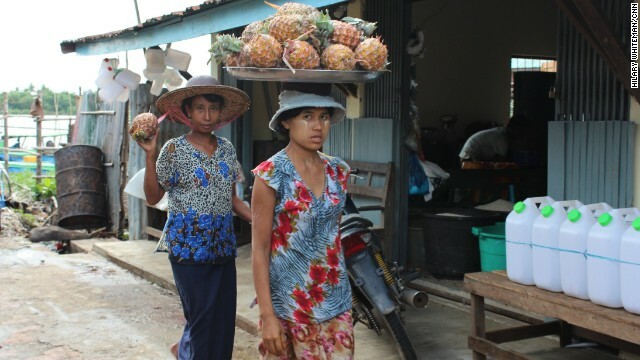 Women in Bogale take pineapples from boats on the nearby river to street markets to sell. 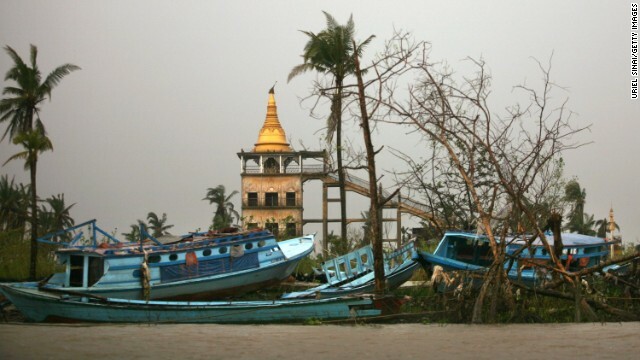 Bogale is virtually surrounded by water and was one of the townships hardest hit by Cyclone Nargis in 2008. 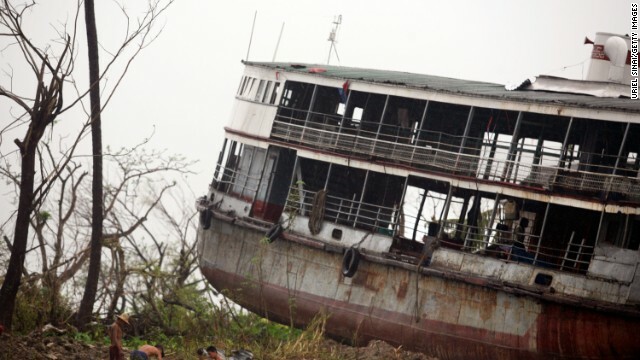 The shell of a ferry is dumped on land in Bogale by fierce winds and waves whipped by Cyclone Nargis, in a photo dated May 18, 2008. Around 140,000 people were killed across Myanmar in the country's worst ever natural disaster. More boats line the shores in Bogale. 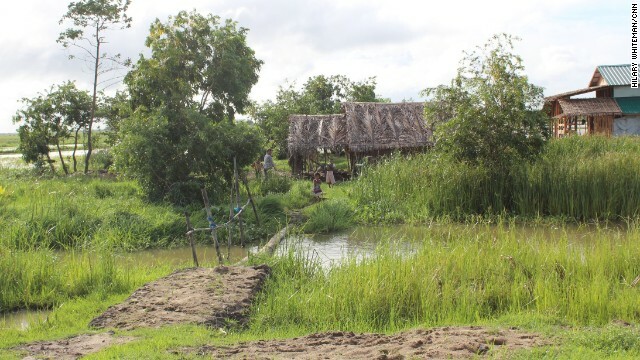 Cyclone Nargis wiped out farming land, livestock and the majority of houses when it swept through in 2008. Cyclone Nargis also separated families. Soe Paing said after the cyclone he sent some of his children to a monastery in Yangon. While there, his eldest son was lured into the army by recruiters. He was just 13. 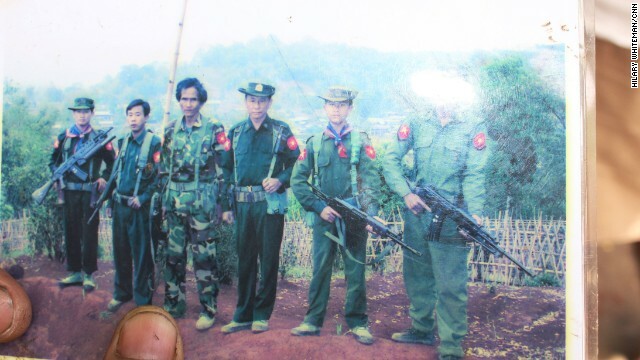 In this photo, Soe Paing's son Zaw Zaw Lin stands second from the right. He wears a Myanmar military uniform and holds a gun. Zaw Zaw Lin spent more than three years in the army before he was freed. This boy poses on barrels in Bogale township. Boys like him are vulnerable to recruiters who are either paid for signing up recruits, or can reduce the amount of time they have to serve, if they themselves are in the army. 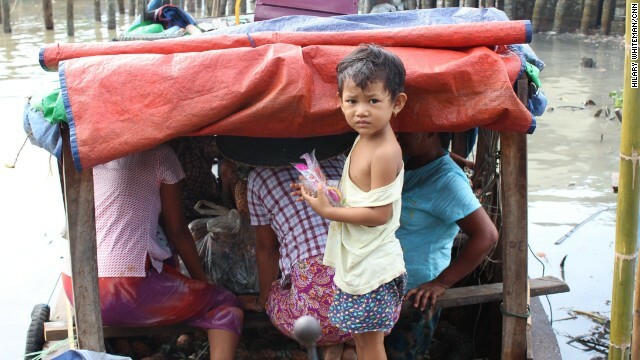 This young girl is with her family on a boat in Bogale, but Cyclone Nargis created many other young orphans. Boys separated from their families are easy targets for army recruiters because few people will miss them. 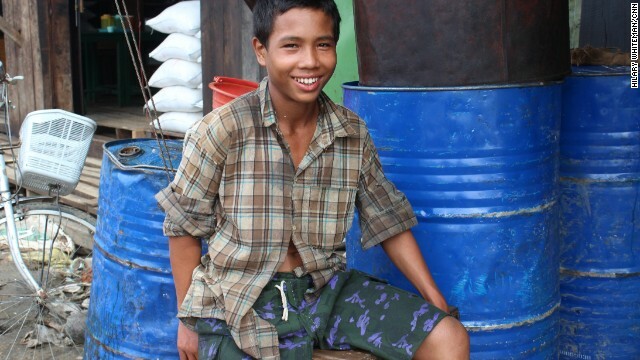 Bogale sits in Myanmar's Irrawaddy, a region once known as the world's "rice bowl." Decades of military rule destroyed the industry and now many locals eke out a living at the local markets or by selling food from family plots. The water is still a feature of life in Bogale, and locals use boats to move produce from one town to another. Many children work in their family business' including tea houses and grocery stores. The country's education system was all but dismantled during decades of military rule. Should he be in school or the army? Rights groups say many of the children have had their identification papers forged, and so far researchers have had limited access to verify their presence within units. "I don't think anybody at this stage has got a clear number in their mind about how many underage recruits there are in the Tatmadaw, but the belief is it's considerably more than the number who have currently been discharged," said Steve Marshall, the International Labor Organization's Myanmar liaison officer. Since the Myanmar government signed a U.N. pact in June 2012 to rid its forces of children, 176 have been freed. The most recent release was in August 2013, when 68 children were allowed to leave, an occasion marked by a ceremony attended by senior military and social welfare officials. It's likely many more remain in the military's ranks; some who are suffering in oppressed silence, others whose families are desperately seeking their release. CNN met Zaw Min Paing in Bogale, a small township four hours' drive south of Myanmar's former capital of Yangon, in the country's southern Irrawaddy region, an area once known as the "rice bowl" of the world. 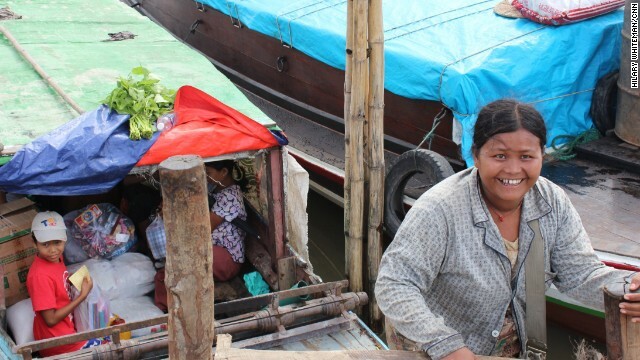 Decades of military rule first destroyed the region's crops before Cyclone Nargis barreled through in May 2008, sweeping away homes, businesses and livelihoods. Around 140,000 people were killed across the country, many of those in the Irrawaddy region. Of all the townships, Bogale was one of the hardest hit. As well as wiping out whole streets, the cyclone separated families, creating easy targets for recruiters who preyed on orphans and other vulnerable children whose identity papers had been washed away, Marshall said. In recent years, the town has become less of a focus for recruiters who are active in a number of areas around the country, rights groups said, particularly in cities where they thrive on the anonymity of street children; the boys who won't be missed if they suddenly disappear. Soe Paing holds an image of his son Zaw Zaw Lin who was recruited while at a monastery in Yangon. Between nail-bitten fingers, Soe Paing, 39, holds a crumbled, laminated photo of his eldest son, Zaw Zaw Lin. The boy, then just 13 years old, stands with five other soldiers, all wearing Burmese military uniforms. He's carrying a gun. "After Cyclone Nargis, I sent some of my children to the Rangoon (Yangon) monastery. After one year they live in the monastery, one disappeared, was missing," he said. "I tried to contact the monastery -- they also don't know. Even I'm using the state newspaper -- I was advertising 'I've lost my son, please help me find my son, please contact me.' Nobody contacted me," he said. It was two years before Soe Paing heard what happened to the eldest of his five children. Law enforcement officers phoned him to say his son was in the army and allowed the two to speak. "My son told me 'I'm not happy I'm trying to escape from this army,'" Soe Paing said. The teenager said he had been recruited as he stood in the street, collecting food in an alms bowl from passersby. Soe Paing's son (second from the right) was recruited at the age of 13. Soe Paing contacted officials from the Human Rights Defenders and Promoters, a local advocacy group working to free child soldiers. They lobbied for his son's release and 18 months later, he returned home. 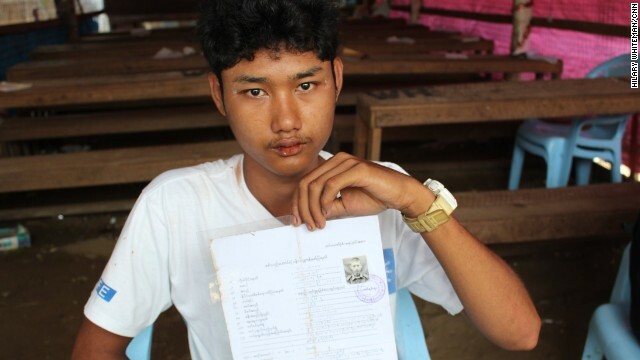 Still just 16, Zaw Zaw Lin had served three-and-a-half years in the army. Now 19, his father says he's no longer the same boy. "Some of his attitudes and behaviors are very rude," he said. Soe Paing not only fears for his son's future, but worries every time he steps out of the door. "I'm worried that some military people will catch him again. Even though he's out of the military he doesn't have an official resign letter -- he's only got the protection letter," he said, referring to the letter provided by the ILO which warns that the holder is in fact a child whose potentially illegal recruitment is being reviewed. Marshall said in many cases the letter, along with the submission of the child's case to the government, was enough for a boy to remain with his family before being a formal discharge. "Unfortunately, in some instances the local personnel, not the central personnel, for a variety of reasons -- I think largely because they feel that they've got an obligation to uplift this deserter -- will arrest the boy and he will at a local level be charged through the military court process and convicted of desertion," he said. "In that instance, it makes our job harder because in fact we not only have to get his discharge but we also have to get that conviction quashed and the boy then released from prison. "Fortunately, in the main we are finding that those protection letters together with the submission of the complaint are providing a level of protection. Unfortunately it's not universal," he said. Some of the soldiers are walking up the stairs and their shoes are kicking out the sand to the lower level where we're eating. In June 2012, after five years of negotiation to end the use of children as state soldiers, the Burmese government signed a Joint Action Plan with the United Nations. The plan gave Myanmar's armed forces 18 months to take "measurable steps" to release and reintegrate children serving in the Tatmadaw and Border Guard Forces. It pledged to immediately stop underage recruitment, strengthen vetting procedures and take action against perpetrators. It also said it would allow U.N. workers unimpeded access to military bases, prisons and other areas to check for the presence of children. However, two months before the December deadline to rid its forces of children, Marshall said much more work needs to be done. The deadline will need to be extended, he said: "You're not talking a matter of a few months, you're looking at a fairly extended additional period." In August, billboards started appearing around the country showing the image of a young Burmese boy. One side of his face is daubed with thanaka, a local version of sun cream locals make by grinding bark, the other side is smeared with camouflage. A slogan asks: Should he be sent to school or the army? It's one of 66 posters erected outside recruitment centers and in areas considered prime targets for recruiters, including jetties, bus terminals and railway stations, according to UNICEF. In the next few months, a telephone hotline will be set up to allow anyone to report suspected cases of underage recruitment. It's the first time such a sensitive issue has been so publicly addressed by the government, which is working with UNICEF to spread the message that young boys don't belong in the army. In a briefing document released in September, the ILO said the military was "responding positively" to complaints about under-age recruitment, and in a "very high proportion" of cases, culprits had been found and punished. Some offenders have received prison sentences, though the ILO notes that punishments are yet to extend up the chain of command. And recruiters are still on the prowl. If you look at the number of complaints, reported recruitments have fallen over the past year but it doesn't mean the practice has ended. "If you look at the number of complaints, reported recruitments have fallen over the past year but it doesn't mean the practice has ended," said Charu Lata Hogg, Asia program manager at Child Soldiers International. "Military officers still go out into urban areas, predominantly bus stations, railway stations or crowded market places where they identify and accost young children." Civilian brokers are also at work, she said, who are paid anything from $30 to $50 (roughly 30,000 to 50,000 Burmese Kyat) and perhaps a can of kerosene for each recruit. Serving officers don't earn money but can buy early retirement by signing newcomers. Even providing just one or two could shorten their years of service, Hogg said. "There is an incentive to maintain troop numbers and the choice of military career is not an attractive option for many and hence that is one of the drivers of underage recruitment," she said. Very little is known about the size and capability of Myanmar's army due to the secrecy that shrouded the country during 60 years of military rule, before the election of President Thein Sein in 2010. The best guess is that there are around 320,000 military personal with 50,000 reservists, according to defense and security analysis from Jane's. For decades, the Myanmar military has been fighting a number of long-running insurgencies, with several ethnic groups demanding greater autonomy. In recent years, the government has signed peace deals with more than a dozen armed groups but pockets of resistance remain. I was firing guns at the KIA soldiers [but] I just fired the gun pointing in the air because I was very scared. Seven of Myanmar's "non-state armies" also use children to fight, the U.N. says, though rights workers say at this stage it's all but impossible to say how many there are or if they'll ever be freed. What happens when a boy joins the army? New recruits to the Myanmar military, including boys as young as 11, are sent to recruitment centers where they receive four-and-a-half months of basic training before being assigned to a battalion. During their service, they're treated the same as adults. Some are known to have served on the front line. One 16-year-old Burmese soldier told researchers his battalion fought the Kachin Independence Army in the country's north, before they captured him in 2011. "I was firing guns at the KIA soldiers [but] I just fired the gun pointing in the air because I was very scared," he said, according to a 2013 report from Child Soldiers International, "Chance for Change -- Ending the recruitment and use of child soldiers in Myanmar." Other children sent to the front line are used to carry weapons, detonate landmines and work as porters to carry goods and rations, the report said. Zaw Min Paing stands with his parents who pushed for their son's release from army training. In some senses, Zaw Min Paing, the aspiring mechanic, is one of the lucky ones. His family found out relatively quickly he'd been recruited so he was freed after four months, while still at the training center. But even there he describes bullying carried out by older soldiers who saw young recruits as easy targets. "Sometimes when I'm eating, some of the soldiers are walking up the stairs and their shoes are kicking out the sand to the lower level where we're eating -- it's very bad," he said. At night he said heard a slapping sound; the sound of older soldiers hitting the faces of young recruits with their shoes so they wouldn't complain. After lobbying by local rights workers and the ILO, Zaw Min Paing was allowed to leave the army a few weeks before finishing his training. He's back at home in Bogale now, but has given up hope of ever finishing school. "Even though I want to go to school, that's not possible because when they released me from training center my exams had already finished. So I'm repairing the motorcycle," he said. The rapid pace of reform in Myanmar has raised hopes that the government is committed to ridding its army of underage fighters. 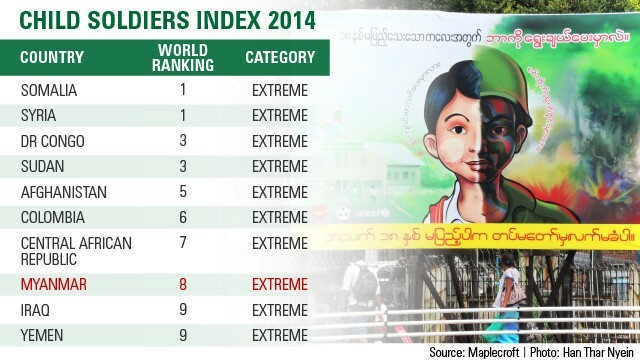 However, according to analysis from risk analysis company Maplecroft, Myanmar still ranks number 8 on the global index, where its use of child soldiers is considered "extreme." Han Thar Nyein contributed to this report. Paula Newton meets the surviving member of the Moustache Brothers who isn't afraid to poke fun at Myanmar's past. Across Asia, red-stained teeth reveal a deadly habit to betel quids; potent parcels of areca nuts and tobacco which are known to cause oral cancer. Zaw Min Paing is just one of an unknown number of child soldiers who has served in Myanmar's military. Myanmar is opening up, and the government is working hard to welcome a plane loads of visitors from around the world. CNN's Paula Newton takes a train journey into the country's future after decades of military dictatorship. A decade on from his first stay at a Buddhist monastery, author Rupert Arrowsmith says the changes mirror what's going on in Myanmar. CNN's Paula Newton explores a mission to preserve the country's past at a time when all eyes are on the future. CNN's Paula Newton explores the Shwedagon Pagoda, a Buddhist location that attracts pilgrims from all across the region. How do Burmese punks keep their mohawks standing tall? Just one of many things to ponder before you go there. Lights flicker on and off at any hour of the day, sending visitors' eyes toward the ceiling, while locals carry on without a pause. When Burmese commuters have an accident they don't dial 911 or any ordinary emergency service. Here's a look at what you need to know about Myanmar, a country in southeast Asia formerly known as Burma.